I saw in a vision as I prayed, a white, stone staircase that extended from earth to heaven. Around it was a deep blue sky, studded with thousands of stars, and open space as in the atmosphere. The staircase was made with unhewn stone, so that its steps, which were wide but extremely narrow, were also rough and uneven. There were no sides or railings to this staircase, so that it seemed to be suspended in mid-air. Each step on the staircase represented a day in the believer’s life: another quiet time where they stood on the staircase and called to meet with Jesus. I saw that whenever a believer called to Him, Jesus descended from an area at the top of the stairway down to the level of the stairs where the believer was standing. He appeared in human, manly form, wearing a white robe, and met with the believer to talk with them each day as they continued their daily climb up this staircase. It was a picture of the believer’s life-connection with Jesus, from birth to death, start to finish. When the measure of their days is fulfilled, believers will have reached heaven, Jesus’ abode. Because the steps are wide but very narrow, they do not lend themselves to long periods of rest or stagnation; their sole purpose is to provide a solid place on which to stand in communion with the Lord as a believer continues in his day. Our communication with the Lord, while progressive, is as an upward climb, bringing us ever closer to Him. We have no need to return to the “first principles” we have been taught, nor do we need to return to our past. At every step on the stairs, when we call to Jesus, He brings us fresh revelation. Also, at the step where we stand, we have opportunity to reach down and pull up those who have lost their footing or who cannot seem to climb onto on that first step. Every new day, every quiet time, every step represents a fresh encounter with Jesus, even if the stairs themselves feel uneven and rocky beneath our feet sometimes. I pray you will keep climbing, keep seeking the One who responds to every call, coming quickly and lovingly to meet you on your spiritual stairway of life. Pray.Network Interviews Deborah on Life-Giving Prayer! 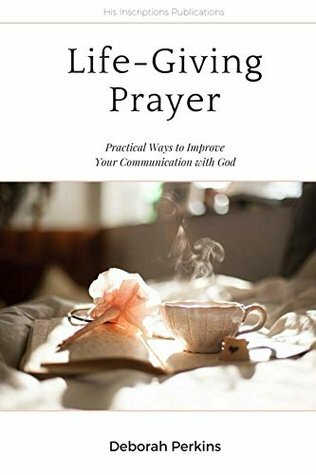 This week, Phil Miglioratti and I discussed my new book, Life-Giving Prayer, in an interview for Pray.Network. Click here or on the photo to read this in-depth Q&A on Prayer - it's packed with insight! During the month of February, Deborah is sharing God's love by giving away 100 copies of her newest book, Life-Giving Prayer! ​(Kindle/e-Reader version) Click below to enter. ​Are YOU a writer interested in publishing your own book? editing and publishing services especially for Christian writers!